Congratulations to "Amy S." the winner of Eliza's giveaway. Thank you to all who participated! Psst. Can you keep a secret? Your life might depend on it. You witnessed a major drug deal gone bad and your testimony just took down the biggest drug lord in history. You’re a hero! However, rather than celebrating with family and friends, you have an hour to say your goodbyes before a U.S. Marshal whisks you away to your new life in the Federal Witness Protection Program. You can’t tell anyone where you are going or your new identity. Your life is about to change forever. The following are the steps you’ll need to take to enter the program. First off, you should know the program is actually called the Federal Witness Security Program. Over the years,authors and movie producers have taken a certain amount of creative liberties when writing about the program, such as changing its name. You’ll also need to change your name. This is your chance to take on an exotic sounding name like Sophie Fontaine. However, it’s recommended that you keep your first name and initials, so if you’re about to start writing or saying your real name you can catch yourself. And you don’t want your family members hollering your new name down the street or your neighbors will start to wonder. The good news is you can keep your monogrammed towels, since you’ll likely be able to take some personal belongings. You may be allowed to take furniture and clothes, but you’ll need to destroy your birth certificate, social security card, credit cards, and all personal documents. A few family photos are okay, if they don’t provide clues to your past. No wedding photos of you standing in front of a church with the Seattle Space Needle in the background. This is your chance to relocate from the harsh Midwest winters to sunny San Diego. Or if you’re tired of the scorching Phoenix summers, head for the Colorado Rockies. However, if you’ve always wanted to live in San Diego or Denver, then everyone probably knows this. You’ll be asked to write down the top ten or twenty places you’d like to live, and then you’ll be relocated to the last spot on your list. So if you really want to live in San Diego, list it last. However, if you want to stay alive, then be honest. Say goodbye to Facebook, Twitter, and all social media. Not only do you need to cancel your current pages, but don’t be tempted to create accounts under your new identity. One night, you might feel lonely and reach out to loved ones in cyberspace. Now, it’s out of your control if the bad guy posts your picture on Facebook, claiming you’re a long lost love he wishes to reunite with and suddenly your pic goes viral and people recognize you.So if you’ve ever wanted to be a blonde or Botox away those wrinkles, this would be the time to do it. However, WITSEC won’t pay for your new look. If you’ve secretly wanted to try parachuting or bungee jumping, go for it. Not that you’re suicidal, but you can’t continue hobbies that could lead the bad guys to you. If you’re an avid Chagall collector, you could be easily tracked down if you’re bidding on Chagalls at auction. Art is a small world, especially with everything being computerized. If you’re a triathlon runner and subscribe to a triathlon magazine, a bit of a niche, someone could cross-check the magazine’s mailing list against public records and determine your name is absent from most records. The bad guys are sneaky, so you need to be even sneakier. Tear up your resume you’ve worked years to perfect. You need to start from scratch, especially if you are in a career that would be easy to trace, such as a doctor or a lawyer. The program will help with job placement and career training. So the technicalities are done. You are prepared to enter the Federal Witness Security Program. But emotionally, will you ever be ready to give up your family, friends, and current life, and never look back? 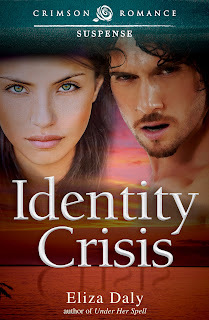 Giveaway—Thank you so much to Just Romantic Suspense for having me here today and helping me celebrate the release of Identity Crisis. I will be giving away a $10 Amazon or Barnes & Noble gift card to one commenter. To enter to win, please leave a meaningful comment or question about my post. Please include your e-mail address with your comment. The winner will be announced March 28th. Thank you for stopping by! When Olivia Doyle’s father dies under suspicious circumstances, rather than inheriting a family fortune, she inherits a new identity. She learns they were placed in the Federal Witness Security Program when she was five years old. Her father was involved in an art forgery ring and testified against the mob. Brought up not to trust anyone, Olivia has a difficult time relying on U.S. Marshal Ethan Ryder to protect her, and to keep her secret. She fears her father may have continued his life of crime through her art gallery. She has little choice but to depend on Ethan when she realizes someone is now after her. Olivia’s search for the truth leads her and Ethan across country to a family and past she doesn’t remember. At the age of ten, Ethan witnessed a brutal murder. He vowed when he grew up, he’d protect people in danger. Protecting Olivia is difficult when she won’t trust him. He soon realizes his desire to protect her goes beyond doing his job, but if his judgment becomes clouded by emotions, her safety could be jeopardized. Can Ethan and Olivia learn to trust each other when they uncover secrets that will change their lives forever? Eliza Daly’s first attempt at creative writing was in fourth grade. She and her friends were huge Charlie’s Angels fans and she would sit in her bedroom at night writing scripts for them to act out at recess the following day. She was Kelly Garrett. Fast forward to the present, she’s still writing stories about beautiful women who always get their men. The journey from fourth grade script writer to published author wasn’t an easy one, but it was always an adventure and the final destination was well worth it. When Eliza isn’t traveling for her job as an event planner, or tracing her ancestry roots through Ireland, she’s at home in Milwaukee working on her next novel, bouncing ideas off her husband Mark, and her cats Quigley, Frankie, and Sammy. You can find Eliza on the web at Website, Facebook, Twitter and Goodreads. Giveaway ends 11:59pm EST March 27th. Please supply your email in the post. You may use spaces or full text for security. (ex. jsmith at gmail dot com) If you do not wish to supply your email, or have trouble posting, please email maureen@justromanticsuspense.com with a subject title of JRS GIVEAWAY to be entered in the current giveaway. Yeah, I could handle everything but the give up my family and friends part. Okay, and probably not the social media part either. :-) Thanks for checking out my post! I have not read your work but this book caught my eye. I have always wondered about the Witness Protection Program. It would ge so difficult to give up your family, friends and career.I have heard of real cases when the bad guys have gotten close and they have had to move and change your name,etc. I have not read a book about the Witness Protection Program previosly and I would love to do so. Identity Crisis sounds like a great way to start! Thank you for this contest. It would seriously be a nightmare, wouldn't it? I can't even imagine. Thanks for stopping by! Great post! Very interesting. Sounds like a great book. Thanks so much for popping by and reading my post Angi. I appreciate it! Love your post, Eliza! Thank you for making me realise I don't want to be in a witness protection programme. I was laughing out loud at some of your comments. Off to buy IC now so yay! Oh, we laugh now Cait, but you never know... Lol. I certainly hope we never know what it's like to be stuck in the program. I hope you enjoy Identity Crisis. Thanks so much! Lovely post, Eliza. What a great premise for a romance novel. Here's wishing you many sales! Thanks so much for stopping by and reading my post! I can't even imagine having to totally change your life and leave everything you know and love behind! I guess I'm glad I live such a boring life and don't have to worry too much about the Witness Protection Program! Thank you so much for having me here today at Just Romantic Suspense. It's my first time and I'm very excited to be celebrating the release of Identity Crisis with everyone! Identity Crisis sounds great. What sort of research did you have to do for this book? I couldn't imagine having to change my whole life. I do know where I would want to live. Hawaii. Amy, I'm obsessed with the WITSEC program. I've read most books--fiction and non-fiction--and watched every movie about it. The most informational book out there is WITSEC--Inside the Federal Witness Protection Program. It's written by Gerald Shur the program's founder. I've also been studying art and art forgery for years, so it was nice to put that background into a book. Hawaii would be an excellent choice! Thanks for stopping and for the question! Sounds like a very interesting book. I would have problems leaving my family. I wonder if you can take your pets with you. Thanks for the giveaway. Good question. You should be able to take pets with you no problem. The only time that might be an issue is if Fido has some rare disease that he is receiving treatment for and he can only go to one of five specialists in the U.S., or something like that which would allow the bad guys to track you down. Thanks for stopping! Lol, sounds like you're good at keeping a secret. Should help if you are ever whisked away and placed in the program. Thanks for sharing! Thanks so much Colleen, I hope you enjoy it! I know, I'm a big routine person also. We were looking at moving to another town nearby and I'm thinking through having to change to another library, grocery store, etc. and I'm like, I don't think I can do it. I like routine and familiarity. I did a blog post yesterday titled The Top Reasons I Would Get Kicked Out of the Witness Protection Program. Thanks for stopping! Thanks so much Erin! Yeah, the starting from scratch is enticing to me sometimes but I know realistically I couldn't do it. And yes, how would we give up book blogs??? This one sounds really great. I'm putting it on the wish list!! I don't think I could ever go in witness protection, and give up all my family, that would be really hard. Thanks for the great post and giveaway. Thanks so much for stopping by Martha and reading my post. I appreciate it! I could "leave myself behind" if it meant my family would be safe. I would much rather know they were safe and never see them again than be with them and watch them come to harm because they were with me. I would hate it, but I could endure it. I, hopefully, never have to answer that question for real though! Yeah, hopefully we are never put in that position Julie. :-) Thanks for stopping by and commenting! How brave these people must be to turn evidence and go into this program, changing their lives forever. Even then, I can imagine they would be looking over their shoulders the rest of their life. Your a new author to me and enjoyed your post. It sounds like your love for and research of this organization will make it a great read. Congrats! Thanks Brenda! Yes, I am a bit obsessed with the WITSEC program. I read every fiction and non-fiction book about it that I can get my hands on. I've done so much research I've considered writing additional books on the program. Thanks so much for popping by and giving my post a read! If it meant my life or my children's, I wouldn't hesitate. I've always wondered if my small city houses people that are in the WITSEC program. I used to have neighbors that didn't have a listed phone number and just up and moved without telling anyone. I ran into them a few years later and they gave me a nonworking phone number to reach them. It made me wonder. Congratulations on the release. What a cool story Janet, thanks for sharing. You never know. WITSEC places people in the most unsuspecting locations. I see a book in that. :-) Thanks again for sharing! HI! This sounds like a great book. I don't know if I would be brave enough to leave everything behind, especially my family! Thanks for the giveaway! I haven't read any of your books before but I plan to pick this one up tomorrow! I stumbled upon this while doing research for my own novel and would love some advice if you have any for me. I know this is very belated but I would really appreciate it if you could tell me anything about the Witness Protection Program and writing about it. I am quite the amateur. If you could please e-mail me at fhawkins1221@gmail.com I would be so grateful! I am so excited to read this by the way anything like this always interests me.